The TimeLog app records (=logs) points in time: the date and time of day. Additionally it can record 2 describing texts for each point in time, either automatically (categories) or manually (comments) Logging a time is very easily done: Just touch an icon - called widget - on the home screen of your mobile phone. 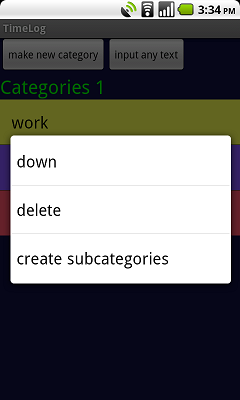 Optionally you can create a subcategories for each category. Also optionally you can log your location with each point in time. The logged times are saved internally on the mobile phone. You can view them in a list. You can edit or delete each one of them. Or you can delete all of them at once. But most important: You can export them, either to a file on the SD-card in the phone, or as textual content of an email, that you can send anywhere The content of the file or the email is just plain text, where the fields are separated by commas or tabs (selectable). Such texts can be read by almost all computer programs, e.g. Excel, Word, databases, so the collected data can be further processed by the programs. For example to sum up time spent working or jogging, create statistics, prove, that too much time is wasted in conferences, etc. This evaluation and processing of the collected points in time is not done by TimeLog, but is the responsibility of the programs utilized by the user - you. Touch an empty spot on the home screen until a window opens. Select 'widget'. Scroll through the list that appears until you find the 'TimeLog modern' or 'TimeLog classic' entry, and click it. Finished! That's all, TimeLog is ready for work. (In the picture below you can see the classic icon). The icon looking like an old clock is the TimeLog widget. To log a time just touch the widget on the home screen. If required - it will be, if you set the number of categories in settings to 1 or 2 - you can now log up to 2 texts (categories). Then you hear a click-clack noise, like from an old factory clock machine, and your point in time is logged. At the top of the screen a notification appears, telling you also, that the time was logged. Done. You can open that notification and read it. You can delete it. Or you can click on it to see a list of all logged times. You can open the list of all logged times anytime you want by opening the TimeLog app like any other app on yout phone. Settings. Here you determine important parameters of TimeLog. Write fle. All logged times will be saved to a file on the SD-card. Send email. All logged times will be written into the text of an email.. Your email app will appear, where you must send the email..
Delete all. All saved times will be deleted. You should do that only after having saved them to a file or sent as email. Number of categories. Determines, how many additional texts you will enter after clocking the widget: none, one or two. Default is none. Sort order. Most recent times at the begin or the end of the list. Silent mode. If selected, logging will be done without an audible notification. Stay open. 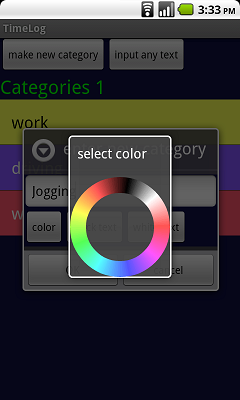 After entering your last category or subcategory you are returned to category 1 instead of the home screen. This help logging a large numer of events that are very close together. . Settings for location logging. You can switch location logging on or off (default=off), and you determine, how often your position is measured (default every 10 seconds). The separator character, that separates the data fields in the text file: select either comma, tab, semicolon or underscore. the data fields to put into the file or email. time in ISO-format. required by some programs for further processing. time in regular format. Easier to read for humans. ATTENTION: Some email programs, like Gmail by Google, convert a separator tab to a space. In that case, use a comma as separator, or use a different email client, like e.g. K-9, that does not have that problem. Short click on an entry in the category list. This entry will be added to the logged time as either category 1 or category 2. Long click on an entry in the category list. A context menu opens. You can move or delete the entry. You can create subcategories for that entry. Make a new category entry for the list. Enter any text u want to be used as category 1 for the current time to be logged. Press the menu button. A short help appears..
How many categories are needed? To record no categories is easiest and fastest: Just click the widget and done. Is useful, if no further description of the logged event in time is required. Example 1: You want to know, how often your parrot says "Hello". Each time it does, you click the widget. For further processing you just add the number of times per day/week/month. You can also find out, if it is more talkarive in the morning or the afternoon.. Example 2: You want to log your daily working time. . You know: times before noon are the begin, times after noon the end of the work. So does the program you use for further processing. One category makes sense, if you want to record few different kinds of event.. 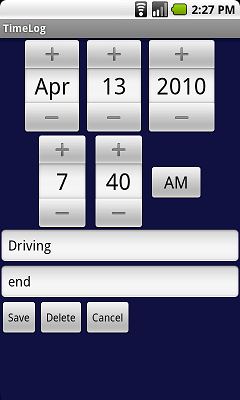 Example: You want to record your working time and the time spent driving. Your entries for category 1 will be: begin work, end work, begin driving, end driving. The list is short, you dont have to scroll, the logging is done in 2 clicks: one on the widget, one on the list entry. Two categories are needed in more complex cases.. Example: You have 3 clients, driving time and waiting time. All of that paid a different rates. Additionally you do sports, lecture in Ikebana and have a 3-word parrot. Categoty list 1 will be: work client A, work client B, work client C, drive, wait, sport, Ikebana, parrot. Category list 2: begin, end, "Hello", "Kiss Me", "Cookie". an unobstructed line of sight to at least 4 GPS satellites is possible. Continuously determining the location costs energy, drains the batteries of the device.. So, in the settings for location logging of TimeLog, you can set, how often the position will be determined. Ranges from 'once every 10 seconds' to 'once every 5 minutes. Please send error reports, questions, comments and ideas for improvement to timelog@aschenbrenner.com.